The dyke has broken. What began as a meager trickle of European custom builders competing – and eventually winning – in the formerly American-only custom bike fortress of Daytona Beach, has grown into a deluge of mind-boggling, eye-pleasing, and indeed heart-stopping showcases of custom building at its finest coming from across the big pond. German custom guru Fred Kodlin might have been one of the first to rip a big hole into the already cracked dyke by winning not once, but twice at the 2001 Rat’s Hole Show, but he’s certainly not the only one selling a uniquely American product back to the Americans…after giving it his own and very European touch. It’s sort of – to use a uniquely European proverb – like bringing coals to Newcastle. Last year’s Daytona shindig saw an army of Europeans following Kodlin onto American shores, builders like Marcus Walz and Thomas Habermann, shops like Penz Performance, House of Thunder, Bike Farm…just to name a few who’ve left their imprint on what used to be a purely domestic affair. Harley-Davidson’s new V-Rod has been bowling them over in the old countries, particularly in Germany, because the V-Rod is a lot more like what those shpeed freaks on the autobahn love in a motorcycle: speed, power, agility, quickness…oh, and did we mention speed? We didn’t think we had to. And speaking of speed: Speed-Point is another such shop from the fatherland where the V-Rod was celebrated like the Second Coming of Christ. Folks there were so happy about it, they customized not one, but two V-Rods and promptly brought them back to Daytona to show the Americans what this new wunder-bike means to them. 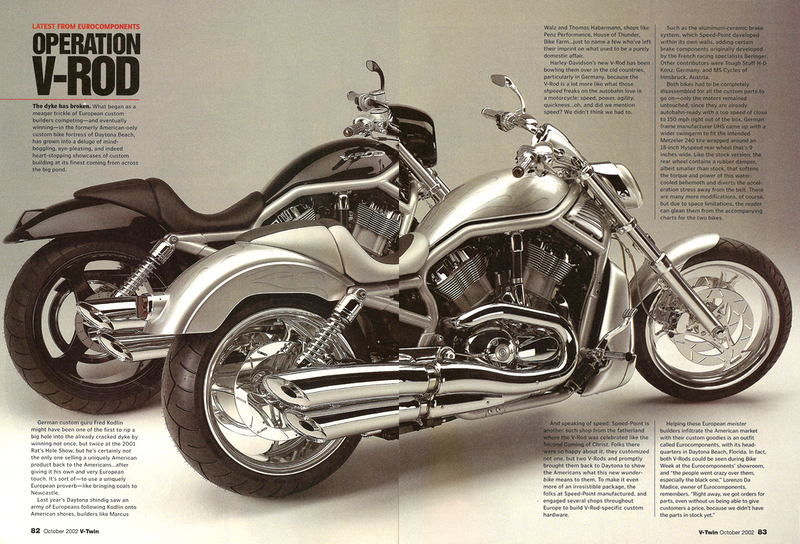 To make it even more of an irresistible package, the folks at Speed-Point manufactured, and engaged several shops throughout Europe to build V-Rod-specific custom hardware. Such as the aluminum-ceramic brake system, which Speed-Point developed within its own walls, adding certain brake components originally developed by the French racing specialists Beringer. 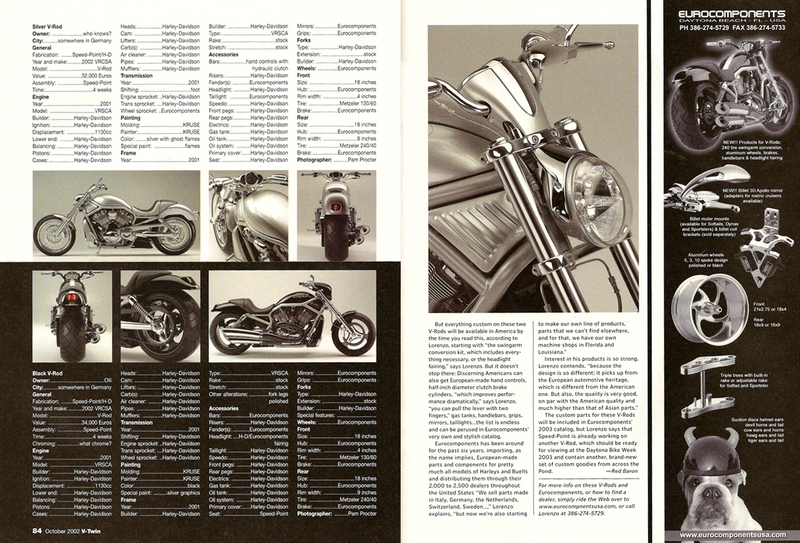 Other contributors were Tough Stuff H-D Konz, Germany, and MS Cycles of Innsbruck, Austria. 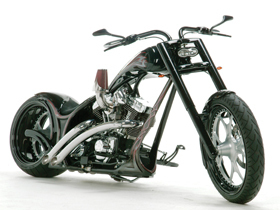 Both bikes had to be completely disassembled for all the custom parts to go on – only the motors remained untouched, since they are already autobahn-ready with a top speed of close to 150 mph right out of the box. German frame manufacturer UHS came up with a wider swingarm to fit the intended Metzeler 240 tire wrapped around an 18-inch Hyspeed rear wheel that’s 9-inches wide. Like the stock version, the rear wheel contains a rubber damper, albeit smaller than stock, that softens the torque and power of this water-cooled behemoth and diverts the acceleration stress away from the belt. There are many more modifications, of course, but due to space limitations, the reader can glean them from the accompanying charts for the two bikes. 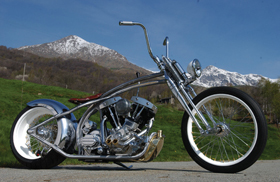 But everything custom on these two V-Rods will be available in America by the time you read this, according to Lorenzo, Starting with “the swingarm conversion kit, which includes everything necessary or the headlight fairing,” says Lorenzo. But it doesn’t stop there: discerning Americans can also get European-made hand controls, half-inch diameter clutch brake cylinders, “which improves performance dramatically,” says Lorenzo, “you can pull the lever with two fingers,” gas tanks, handlebars, grips, mirrors, taillights…the list is endless and can be perused in Eurocomponents’ very own and stylish catalog. 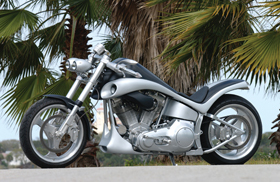 The custom parts for these V-Rods will be included in Eurocomponents’ 2003 catalog, but Lorenzo says that Speed-Point is already working on another V-Rod, which should be ready for viewing at the Daytona Bike Week 2003 and contain another, brand-new set of custom goodies from across the Pond.